My husband found one way to, a-hem, trim the budget by eliminating some of his trips to the post barbershop. Being in uniform meant his hair had to be in regulation. If we – meaning, me – could trim up his hair between regular cuts, we’d save money. 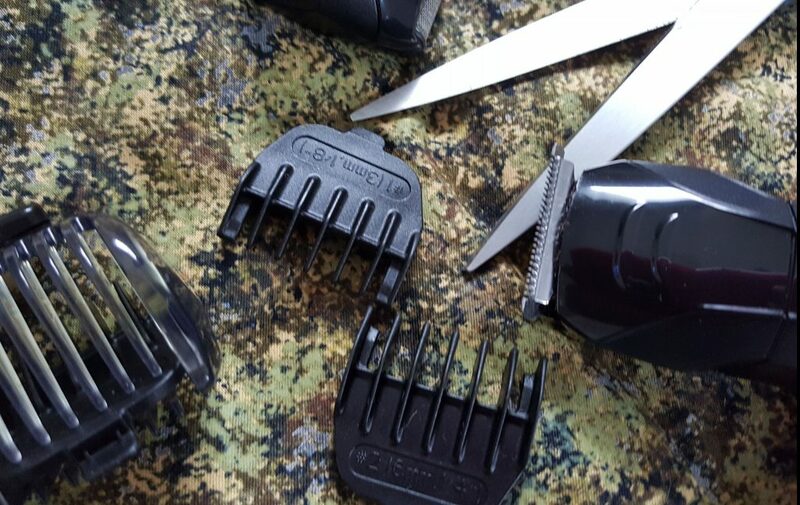 For the cost of two haircuts, he made an investment in a set of hair clippers. I looked over the instruction booklet and got comfortable with the clippers as he settled into a chair. I did get a little nervous trimming around his ears, but was satisfied I didn’t shave them off. Finishing his neckline, I unplugged the clippers. “Wait,” he said. “Can you even out this spot here?” pointing to the top quadrant of his head. “Sure!” I mean, what could go wrong? With newfound confidence, I fired those clippers back up and started to even his hair. “Thanks,” he said, and looked at his cut in the mirror. I wiped off the clippers and put them away. Sweeping up the floor, I deliberated whether or not I should tell him that I had trimmed a bald spot into the side of his head. And that it was the size of a quarter. But, remembering that he wore a cap with his uniform, I just kept my mouth shut. His hair grows fast, I justified. He’d never know. The next morning, I was surprised to get a call from my husband. He never called during the duty day. As calmly as he could, he asked me what the hell I did to his hair. “I thought you wore a hat!” I whimpered. Honestly, I didn’t remember. I was new to this whole military life. Bursting into tears, I apologized profusely. If I had any idea he wouldn’t be in a hat all day, I would have told him what I had done. Nothing could fix that – though rubbing some of his boot polish in the bald spot did cross my mind. We laugh now, but it is nothing but shear terror for me when I see clippers. And undoubtedly, he feels the same. Do you have any hair-razing stories to share? If so, leave a comment! If you like this blog post, feel free to show some love to this writer and share it using the social buttons. Sign-up for emails with posts delivered directly to your inbox! Great story, Lynne. I can really visualize that happening. I’m sure you two laugh at it now, but at the time it was probably traumatic. I remember those haircuts. They sure were fast! Have you offered to cut his hair lately? Thanks for posting. I never, ever dared to give my husband a haircut during his four years in the military (or at any other time). Guess I was pre-terrified. Wish I had met you before, Alana!!! Previous PostPrevious Where were the parents?